We all have something we’re afraid of. Maybe it’s spiders or clowns, but for me, it’s Hallows’ Eve. I’m sure your mind is racing to conclusions but I assure you, you won’t guess why. Many autumns ago I was out for a midnight ride under a full and shining moon. My horse was calm and enjoying the night as much as I, until we heard a sound. An awful sound I can’t begin to compare with anything I’ve heard. It scared my horse who reared and bolted and left me sitting and cursing amongst the fallen leaves. A chill rose up my spine. Quickly, I got to my feet and tried to find the source of the dreadful sound. There before me stood a howling witch, a gruesome looking thing. Boils covered her face and leaked a stinky purplish slime, though her neck and arms seemed oddly unaffected. She screeched, “Every Hallows’ Eve you’ll meet me by this river to wash my face. A demon has cursed me; touch the hallowpox slime myself all my remaining good and perfect skin shall melt away. In exchange, you will live, unlike this doe.” With a wave of her fine-looking hand a deer appeared, and with another, shriveled to its death in front of my horror filled eyes. So, every Hallows’ Eve I have made the trek to the river and washed the witch’s boils clean. Each time I have secretly stashed away some of the toxic slime. This year, I think I finally have enough. The witch’s screams filled the night. Her skin had melted clean away and only bone and sinew remained. My screaming filled the night. Tammy Crosby is a busy working mom who likes to dabble in writing when the mood and timing allow for it. Writers were asked to submitt a Halloween themed original story that was up to 300 words in length. 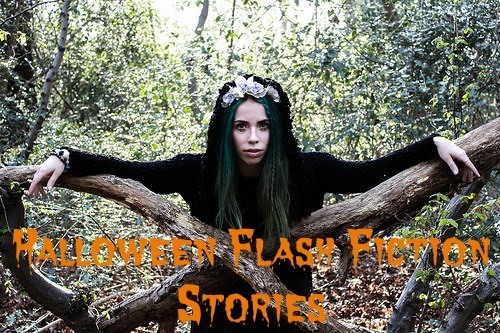 Each Friday until Halloween, a new story will be featured. Please give these brave individuals applause by leaving a comment. Great job Tammy, remind me not to meet you in a dark wooded area. Awesome job. Loved this! Awesome story! Thanks for posting these, and kudos to the author! That was a lovely short. Just the right amounts of pungancy and purity.